Danby 3902504 Features: -For areas up to 1,500 sq. 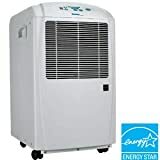 ft. depending on conditions -Energy star compliant -2 speed fan -Adjustable humidity settings -Removable air filter is easy to clean -Auto de-icer prevents ice build-up on coils -Electronic controls -Quiet operation -Casters for easy portability -Direct drain for continuous operation -Color: Light grey -25 U.S. pint (11.8 liters) capacity per 24 hours -Model Number: DDR2506 Keep your basement or crawl space dry with this dehumidifier from Danby. The dehumidifier can hold up to 25 U.S. pints and can keep up to 1,500 sq. ft. dry.